First Abu Dhabi Bank is the Safest Bank in the Middle East and the only bank in the region to hold three ratings in the AA range. The bank was created in March 2017 through the merger of National Bank of Abu Dhabi, which previously held the top position, and First Gulf Bank, another Abu Dhabi bank, which ranked seventh on last year’s list. The new bank has retained the higher ratings of National Bank of Abu Dhabi. Banks from the four big GCC economies account for 40 of the Safest Banks in the Middle East. The United Arab Emirates (UAE) contributes 12, Saudi Arabia 10, and Kuwait and Qatar nine each. The two smaller GCC economies, Oman and Bahrain, contribute four and three, leaving Israel to complete the picture with three banks. 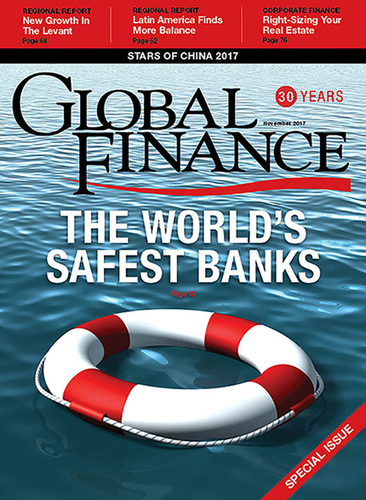 Banks in other Middle Eastern countries do not come close to reaching the 50 Safest. All banks in the 50 Safest Middle Eastern list hold investment-grade ratings. Middle Eastern banks outside the GCC and Israel do not. Moroccan banks come closest, while those in Egypt, Lebanon, Tunisia and Jordan remain deep in sub-investment grade territory. Domestic Bahraini banks also hold sub-investment grade ratings, so they fall outside the 50 Safest. The three Bahraini banks that are included in the ranking—Gulf International Bank, Ahli United Bank and Bank ABC—are able to pierce the Bahrain sovereign-rating ceiling through a combination of foreign ownership and diversified earnings from international, rather than Bahraini, business. Nine of the 12 UAE banks in the 50 Safest are based in either Abu Dhabi or Dubai, the two emirates that dominate the UAE federation, but the smaller emirates of Sharjah, Ras al-Khaimah and Fujairah contribute one bank each (leaving only the tiny emirates of Umm al-Quwain and Ajman unrepresented). Of Qatar’s 10 commercial banks, nine feature in the ranking. The 10th, Masraf Al Rayan gets an A1 from Moody’s—a very high rating for a Middle East bank—but it is unrated by S&P and Fitch and thus ineligible for inclusion: Banks must hold at least two ratings to be included in the list. Similarly, nine of Kuwait’s 11 banks are included. The other two, Kuwait International Bank and Industrial Bank of Kuwait, hold A+ ratings from Fitch but no ratings from Moody’s or S&P. Saudi banks have remained in the top 50 despite a series of steep downgrades last year. Nonetheless, the strongest Saudi bank, National Commercial Bank, ranks only 25th. Moody’s remains the most confident on the Saudi banking system, rating the biggest banks at A1, while S&P continues to be bearish, rating the banks a full four notches lower, at BBB+.